Earlier this spring, The New York Times reported that florals are “poised to become the new summer neutrals.” Though it’s not officially summer yet, that prediction is looking spot-on. Floral prints are so pervasive right now that even a loyal fan of regular old neutrals like me—white on white is my summer uniform—felt compelled to pick up some flora-covered finds this season. Much like leopard, camo and other patterns that are often treated as neutrals, it turns out that florals are surprisingly easy to wear. This floral-print skirt, for example, pairs well with just about every shade of tee or tank, and it can be just as easily dressed up or down. 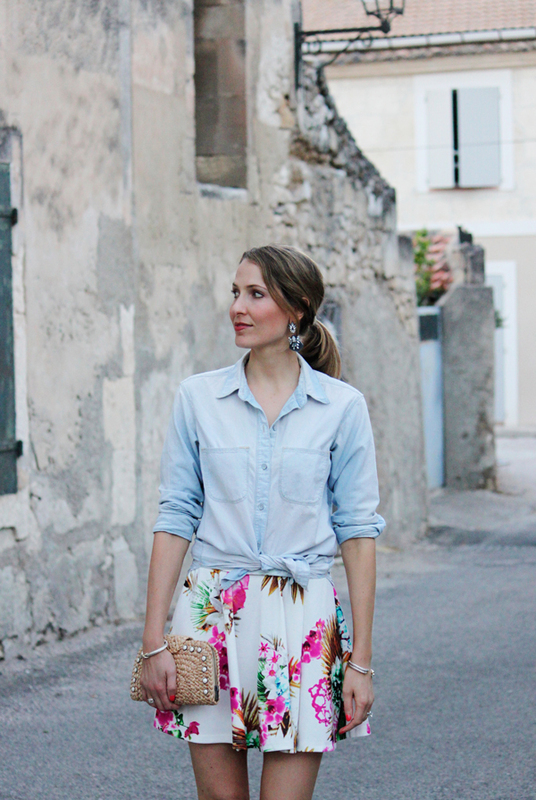 For a summer evening in southern France, I paired this skirt with another goes-with-everything piece, a chambray shirt (the perfectly faded, oversized style I’m wearing has been called the only one you’ll ever need, and I couldn’t agree more!). 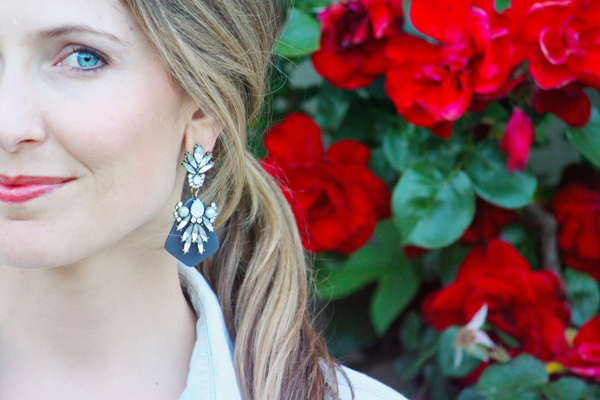 There is, however, nothing neutral about these sparkly statement earrings, which add a little something extra to this laid-back summer evening ensemble. H&M skirt (sold-out online, but here’s a similar style). Madewell shirt. BaubleBar earrings. P.S. More of this season’s florals, and another fun way to wear chambray. Thank you so much for stopping by and for the sweet compliment! I love your blog! I just did my summer shopping and now I know what item I forgot. I didn´t include a floral skirt, damn it. But you look absolutely gorgeous and I think if I was to go out and get a floral skirt I would also opt for a chambray shirt.